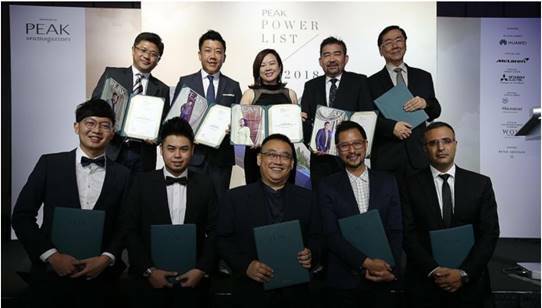 Ten entrepreneurs and business professionals were recognised yesterday for their efforts in going green in their businesses, in luxury lifestyle magazine The Peak’s Power List. The list was unveiled yesterday during a gala dinner at Sheraton Towers Singapore. The annual Power List recognises movers and shakers in a specific area, and this year’s focus was on ecological sustainability. Nominated and selected by the magazine’s editorial team, the 10 honoured are: (top row, from left) Mr Wong Ann Chai, co-founder of Nano Sun; Mr Kelvin Lim, chief executive officer of New Resources Technology; Ms Esther An, chief sustainability officer of City Developments; Mr Wu Tzu Chiang, director of DP Architects; Mr Alan Lee, founder of Elmich; and (bottom row, from left) Mr Aloysius Sng, founder of Refash; Mr Chris Ng (representing Ms Susan Chong, CEO of Greenpac); Mr Eric Ng, CEO of Apollo Aquaculture Group; Mr Bjorn Low, founder of Edible Garden City; and Mr Poyan Rajamand, CEO of Barghest Building Performance.